Members of UNISON, the UK’s public services trade union, are up in arms against the newly formed South West NHS Pay Consortium which they describe as a ‘cartel’, accusing the body of having secretly worked on a pay cuts agenda for months without proper consultation with staff or the union. Robin Whitlock reports. UNISON says that the only way in which they managed to find out about this was via a series of Freedom of Information requests (under the Freedom of Information Act 2000 which grants the public a ‘right of access’ to information held by public authorities). Subsequently a leaked document, known as the ‘Project Initiation Document’ which set out the proposed terms and conditions that the cartel intended to implement throughout the south west, and which various regional NHS trusts have now agreed to, revealed the full scope of the planned cuts to pay and conditions which, radically, includes a complete break away from the NHS Agenda for Change Agreement. Agenda for Change was implemented in December 2004 and was agreed by employers, the government and the unions. It introduced a national grading and pay system for all NHS staff with the exception of doctors, dentists and a number of senior managers. The key benefit of Agenda for Change, besides harmonisation of pay scales throughout the UK, is that it evaluates staff salaries according to particular roles within the NHS evaluated under a special NHS Job Evaluation Scheme. The agreement was specifically intended to provide fair rates of pay for non-medical staff based on a consideration of ‘equal pay for equal work value’. It also provided better links between pay and progression and harmonised terms and conditions of service such as annual leave, hours, sick pay and unsocial hours. The consortium’s Project Initiation Document (PID) basically threatens all that according to UNISON and the Royal College of Nursing (RCN). Under the PID member NHS trusts are obliged to pay a sum of money to help fund the consortium (about £10,000 each according to UNISON). They are also obliged to allow access to information held by Trust directors and commits Trusts to making timely agreements to key decision making. Even a momentary look at this document conveys an impression of surreptitiousness. This feeling is increased by some of the proposed benefits offered to members including membership of a ‘co-ordinated approach to the design of a future PTC (Pay, Terms and Conditions) framework for the South West and access to dedicated HR support, expertise and capacity. The document talks about modernisation of PTC as if the Agenda for Change document was somehow now obsolete. It also suggests that improvements are necessary in order to truly recognise and reflect excellence and particularly refers to the development of a mixed economy within the NHS within recent years which has resulted in a diversity of healthcare organisations working with the NHS, the private sector and social enterprise organisations. Something that is also rather telling of the consortium’s intentions are the references employers facing ‘upward cost pressure on their pay bill’. 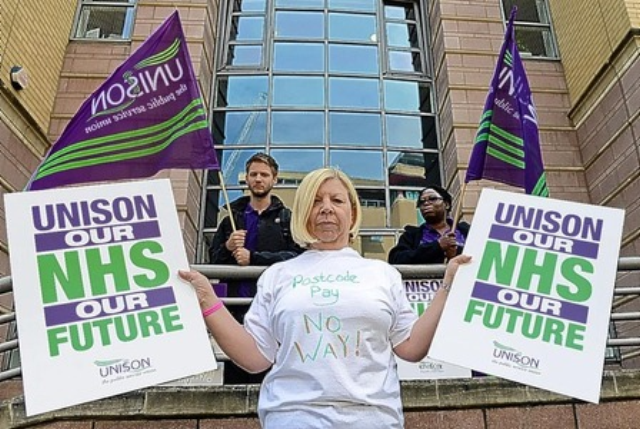 UNISON’s view is that this agreement will drive down pay, terms and conditions and drive skilled healthworkers out of the region with adverse effects to the South West local economy. The union claims that pay will be slashed by 15%, essentially to drive down pay from 68 percent of running costs to 60 percent. This will subsequently have a severe effect on patient care and the local economy the union believes. It further claims that the primary aims of the consortium are to reduce payments for staff working unsocial hours, increase working hours in general, reduce annual leave and reduce sick pay for staff working unsocial hours. The funding contributed by member trusts, of which there are now 20 signed up to the agreement, essentially means some £200,000 diverted towards a rather secretive and possibly undemocratic effort to revise PTC. This money, the union argues, could have been used for patient care. “The document produced by the cartel recognised that engaged and motivated staff are needed to improve health services, yet at the same time they acknowledge that these proposals have a serious risk of severely reducing staff morale” said Sue Orwin of the UNISON South West Regional Health Service Group Executive. “This 15% pay cut comes on top of a second year’s pay freeze for NHS staff who have already seen their take home pay reduced with increased pension contributions. We believe the cartel’s approach is simply a cost cutting exercise which will affect the health of NHS staff in the long term as well, not to mention the quality of services.” She went on to accuse the consortium of undermining national pay negotiations and stated that the South West is the only region in the country which is seriously considering such action. The union believes that the project is an exercise in introducing regional pay by stealth, in defiance of the Agenda for Change agreement. Accordingly, pickets and protests outside NHS hospitals in the region have already taken place in order to highlight the issues, particularly in Poole and Bristol where staff lobbied a meeting of the University Hospitals Bristol NHS Foundation Trust (UHBristol) board. Last week a petition was organised which produced over eleven thousand signatures in just one week including staff and members of the public both within the South West and elsewhere in the country. UNISON isn’t the only working within the NHS to raise objections to the consortium’s plans. The Royal College of Nursing (RCN) has also slammed the plans as not acceptable and not in the best interests of the NHS. The British Medical Association (BMA) also believes that regional pay is damaging to the national interest. Part of its job indeed is to resist such schemes which it believes can be enormously expensive, particularly when it is the government normally which sets limits on NHS pay, primarily the Department of Health and the Treasury. However, it seems that the government itself, especially the Treasury, may be receptive to such initiatives, and that is deeply concerning. According to the HM Treasury website, last autumn the Chancellor, George Osborne, asked independent pay review bodies to consider how public sector pay could be made more receptive to local labour markets and to submit their reports by July 2012. “There is substantial evidence that the differential between public and private sector wages varies considerably between local labour markets” the Chancellor writes in a letter to Jerry Cope, the Chair of the NHS Pay Review Body. “This has the potential to hurt private sector businesses that need to compete with higher public sector wages” the Chancellor adds. The BMA are totally opposed to all this. In a speech given to the BMA Annual Representative Meeting last month, former BMA council chairman Hamish Meldrum branded the formation of the South West Pay Consortium as a ‘cynical move to drive down pay’. The fact that the consortium has been so secretive about their plans, that the South West regional trusts have been the only ones in the country to make such a move and that it took Freedom of Information requests to reveal what they were up to, suggests that the consortium are not playing fairly, and that is an issue that surely has to be addressed. I would like some of these “experts” to work nights and weekends and then be expected to bring home a lower pay for doing either or both. It is not easy to provide excellent care to patients at night, but of course the majority of NHS staff do a brilliant job and are not often acknowledged for it. However if one were to ask the general public, one would find that most find the NHS is a pretty good service and does a fantastic job overall. It is about time that Pay Cartel found other solutions to saving money, cutting enhancements would only lead to most qualified staff working elsewhere, even overseas! There are other ways to do it, ie cutting back on unnecessary heating during summer months and mild weather, stop wasting food, throwing unnecessary food away, allow all hospital workers to wear scrubs (different colours for different roles) and to have them washed on site, surely this would prevent infections and ward closures, hence saving money. Also some of the higher up managers and executives could take pay cuts too, why should frontline staff be targeted? If this attitude continues, the alienation of employees will continue and if enhancements and holidays have been around for years, one cannot be expected to suddenly take it away like that! Please have a rethink!